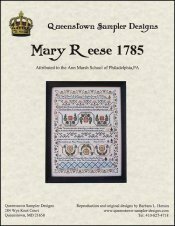 Mary Reese 1785 [C6082] - $24.00 : Yarn Tree, Your wholesale source for cross stitch supplies. Cross stitch pattern by Queenstown Sampler Designs. An adaptation attributed to the Ann Marsh School of Philadelphia, PA. Stitch count 310 wide x 415 high.